Belgium, plagued by old and dangerous nuclear power facilities and haunted by the Fukushima disaster, is planning a wind energy island in the North Sea, 3 km off of the Belgian coast. The island will be doughnut-shaped with a reservoir in the middle that will store wind energy by pumping water out of the hollow middle and will lessen Belgium's reliance on failing, nuclear energy plants. In 2011, around 57 percent of Belgium's energy came from nuclear power. Belgium plans a complete exit from nuclear power as soon as enough energy from alternative sources becomes available, but last year it postponed the closure of its oldest reactor for a decade over energy supply worries. One of the biggest problems with electricity is that it is difficult to store and the issue is exaggerated in the case of renewable energy from wind or sun because it is intermittent depending on the weather. 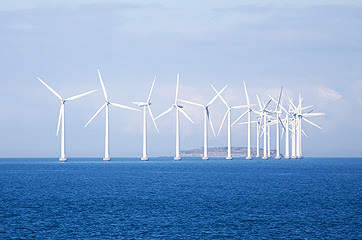 "We have a lot of energy from the wind mills and sometimes it just gets lost because there isn't enough demand for the electricity," said a spokeswoman for Belgium's North Sea minister Johan Vande Lanotte. "This is a great solution," she said, adding she thought it could be the first of its kind. Excess energy would be used to pump water out of the center of the island, and then the water would be let back in through turbines when demand outpaces supply. Belgium hopes to eventually generate 2,300 MW from its network of North Sea wind farms, which could replace a significant part of either of its two nuclear sites, Doel and Tihange, which each generate about 3,000 MW. The wind energy island would also work as an offshore substation to transform the voltage of the electricity generated by wind turbines. Belgium's man made wind energy island could take five or more years to plan and build and is currently still in the planning stages. The project is only a pipe dream until Belgium's power grid operator, Elia, strengthens the power lines leading out to the coast. Last year Belgium's nuclear power operator Electrabel, a division of France's GDF Suez, shut down two of its reactors after investigators found cracks in the reactor casing. Belgium sorely needs this innovation sooner rather than later. P.S.- People always ask me where I get my organic food and personal care products and I love to tell them about The Green PolkaDot Box! Backed by the Organic Consumer's Association and EnvironmentalBooty.com, you can easily buy NonGMO organic groceries, including Harvest Fresh Organic produce, at wholesale pricing online. It's like a Sam's club but focused on products for green, healthy living! You can even shop by dietary restrictions like gluten free, vegan or diabetic and it all comes right to your front door. Enjoy!